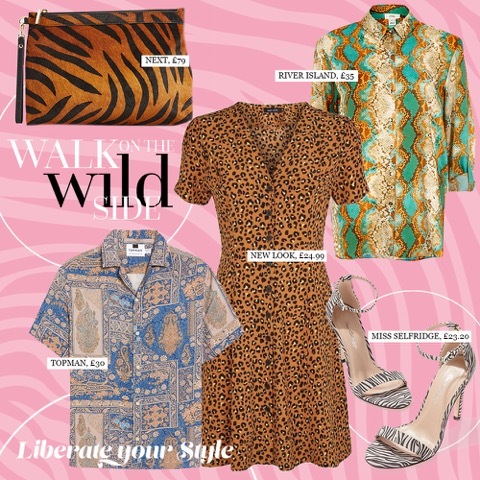 Whether its Leopard, Tiger or Paisley, we are loving the spring summer prints available right now. Unsure if you can pull it off? Rest assured, there will always be a print for you, and it will forever be in style. We’ve trawled through our 100+ stores, pulling out our favourite pieces out there for you to look great, and feel even better, this April. Snake print has officially taken over the fashion world, slowly slithering its way onto the racks of our favourite stores and nestling into our everyday wear. Our favourite piece right now is River Island’s turquoise satin snake print shirt (£35), this bold button up shirt will work great with plain cropped shorts and skirts or can stylishly break up an all-black ensemble. Predominantly reserved for rock stars between the ‘60s and ‘80s, leopard print has since undergone a huge resurgence and is now the fashion world’s favourite pattern. After stalking our prey we’ve got our eyes locked in on New Look’s brown leopard print tea dress (£24.99). Importantly, treat your leopard print like any other neutral colours in your wardrobe, for a bolder outfit we recommend pairing it up with zebra print accessories. Menswear is seeing a spike in patterned clothing this spring summer season and we don’t see anyone doing it better than Topman with their paisley revere shirt (£30). The short sleeved statement piece pairs well with neutral chinos or, if the sun makes an appearance, neutral shorts. Often forgotten, the zebra print is perfect for adding a touch of chic to your monochromatic wardrobe. The impactful print isn’t an overload to the senses and if you’re a beginner to animal print, this is definitely the one for you. We adore these Hester zebra heels in Miss Selfridge (£29), style with smart black cropped trousers and a crisp white shirt for an up-to-date office look. If you’re after one accent piece this April, make it this Whistles tiger print clutch bag found in Next. We suggest accessorising an all-black ensemble with this tiger statement piece. Although, its versatility means it also works stylishly with a laid-back slouchy shirt, denim shorts and your favourite pair of converse. For more inspiration and ideas, from fashion to home to present for loved ones, don’t forget to follow us on Facebook, Twitter and Instagram!